Grass and grazing update – this is a long one. Todays paddock on the left. Yesterday’s paddock on the right. The unseasonably cool weather continues. We had showers come through yesterday evening bringing even more rain and a drop in temperatures. The high today is 83 and we don’t get back into the 90s this entire week! Rain and sun and cool weather are the recipe for grass growth and we have plenty although the cows have done well in the smaller paddocks and there is a definite line of where they have eaten and where they have not. They may be overgrazing a bit but after all the waste of the last rotation, I figured we tighten them up a bit this rotation for comparison. The mineral feeder is in the same state. The cows continue to hammer the phosphorous and ignore all the other minerals. Anyone has yet to see the cows actually use the feeder for more than a scratching post but somebody is eating the phosphorous. I will need to add another bag this afternoon. The cows continue to improve in their condition and are looking better every day. The calves are growing nicely and look like they will be good cows although they definitely want to be out of the paddock. Except for when they are nursing, they spend 70% of their time in an adjoining paddock with their peer calves. Being independent, right next to mom. Kids, whaddya do? Sam, our red Devon, continues to go through the hot wire. Fortunately he didn’t pull the entire fence down this time but I found him out in the main pasture by himself. I got him back in easily enough but we are going to need more juice to keep him corralled I am afraid. The Stafix x6i just doesn’t have enough to keep him in. Darryl pointed out to me this morning that the pigs have broken their waterer. It was pouring water out into the paddock at full stream so that’s on the list to be fixed. I was using PVC. Maybe I need to go back with cast. Of course thats more of a freeze issue in the winter. It’s always something. I mowed an area yesterday before the rain to get the dog fennel down. I know I am supposed to let these pioneering plants do their thing but its so thick you can’t walk through it. I mowed a section in front of the barn close to the main gate. I then raised the mower (this involves a shop and a 3/4 air wrench, its not your dads Snapper) and am planning on mowing at least part of the side pasture at this higher setting. I know as soon as I mow thats its going to stop raining and turn 100 degrees so I hope you all have enjoyed your cool summer. My thought is I will mow one section close, one section high, and leave one section alone. 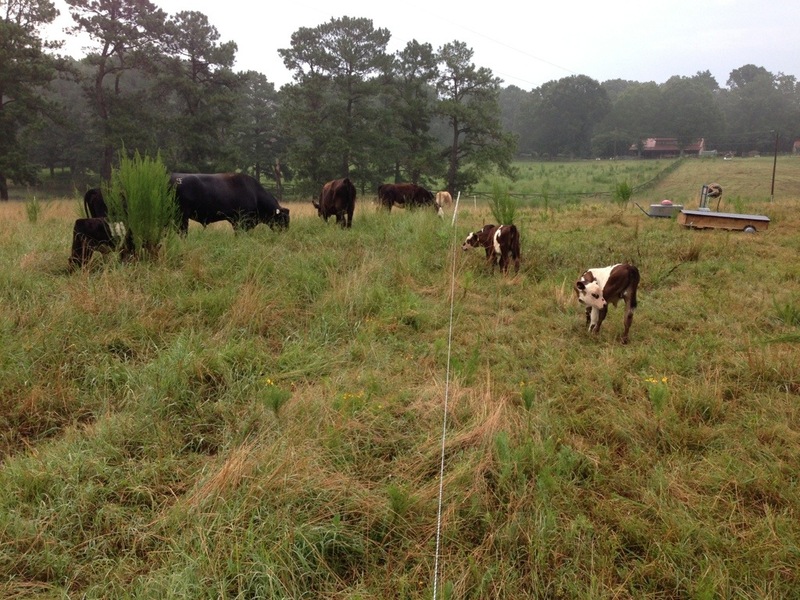 Then we’ll see how the pasture looks later in the season. The fennel isn’t going away anytime soon so may as well experiment. And if the fennel isn’t enough, the bitterweed has started growing in the pasture. It’s pretty if you don’t know better but its just another plant we don’t want growing. Fortunately the solution is the same as all the others. Rotate cows.